If you need extra incentive to advocate for arts funding in the wake of the proposed elimination of the National Endowment for the Arts and National Endowment for the Humanities as part of President Trump’s budget, what better way to receive that added drive than by experiencing the Renaissance? After all, that time period was not only a rebirth of the arts, but they flourished. The period (14th-17th century, Europe) was full of folks who championed the arts. We meet the aforementioned people, dressed in colorful, period attire designed by Gregg Barnes, in the delightfully, unabashedly comedic “Something Rotten!” It’s a Broadway musical, set in Renaissance-era England, that’s a valentine to the theater if there ever was one. The show is performed on scenic designer Scott Pask’s period, colorful set. Much of it is painted. Some of the houses that serve as the backdrop look as though they’ll collapse from their weight leaning against each other. It can symbolize the state of the arts should the NEA and NEH, major sources of federal arts funding, cease to exist, some might say. Shakespeare aficionados will surely recall Shylock as the Jewish moneylender in “The Merchant of Venice” who makes a shocking demand in the Bard’s play. But in “Something Rotten!,” Shylock is a potential theater patron and lover. 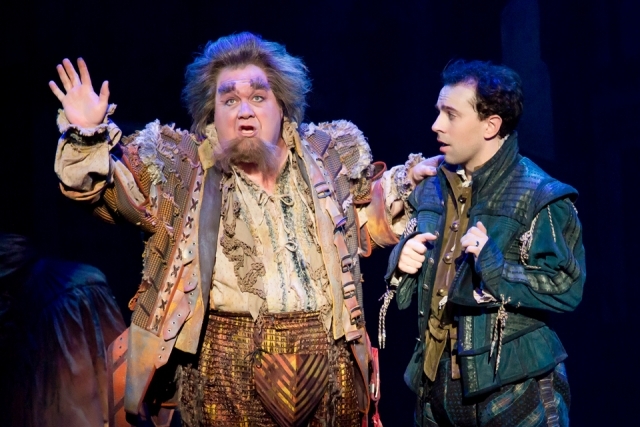 “It’s a temple,” raves Shylock about the theater in “Something Rotten!,” which is enjoying an exuberant run at Ft. Lauderdale’s Broward Center for the Performing Arts through April 2 as part of an Equity national tour. In this rousing production, Shylock is played with enthusiasm by Jeff Brooks, you get the sense that he’d march right down to the White House and rip apart Trump’s proposed budget. “My religion is theater,” Brooks’ Shylock proudly proclaims with fervor. 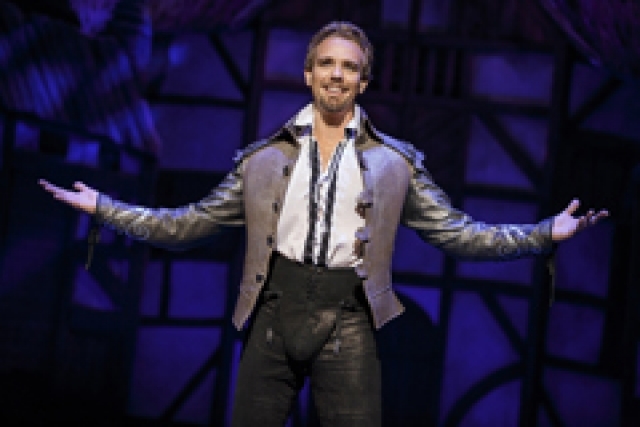 “Something Rotten!” instills such feelings in patrons, particularly theater lovers, as it celebrates the art form even as the show has gentle fun with it. The Bottom brothers, who are central characters in “Something Rotten!,” aren’t having so much fun in the musical, a fictitious account of the creation of the first-ever musical, a send up of musicals and a spoof of Shakespeare. One of the brothers is also named Nick Bottom. He’s the older of the two siblings, a playwright and Shakespeare’s arch rival. How can one compete with the genius that is Shakespeare? What are the Bottom brothers to do when they learn this news? The art of foreseeing the future comes into play, as fortune teller Thomas Nostradamus (a dramatic, eccentric Blake Hammond) comes to their rescue. Something called a musical (“Moosical”) will be the next phenomenon in the theater world of the future. As a theater patron, possessing knowledge that characters in a play you’re watching lack is always a thrill. Nick Bottom says it’s hard to believe people would pay big bucks to see musicals. Well, from what we know about exorbitantly-priced tickets to “Hamilton,” how can we not laugh? We also can’t help but quietly brag to ourselves that we know, unlike the characters, that musicals such as “Chicago,” “The Music Man,” “Annie” “The Phantom of the Opera,” “Cats” "Rent" and “A Chorus Line” have become rousing successes. These are just some of the musicals mentioned. The humor in “Something Rotten!,” which was nominated for the Best Musical Tony Award in 2005, is often of the low comedy variety, as opposed to sophisticated wit. It’s unapologetically silly. At the same time, the show’s a celebration of big, splashy musicals complete with chorus lines and big musical numbers. As for the songs written specifically for “Something Rotten!,” they’re not particularly memorable. And do we really need a reprise of “Welcome to the Renaissance” when that was the opening number? When the show starts, lyricsts and siblings Wayne and Karey Kirkpatrick warmly welcome us, through their lyrics and upbeat music, to the time period. “Right Hand Man” doesn’t serve much of a purpose. It’s sung by Nick’s wife, Bea (a spirited Maggie Lakis), who offers to help her hubby and brother-in-law by getting a job. With an unoriginal, hackneyed title to begin with it doesn’t feature particularly creative lyrics. Shakespeare (a flamboyant, confident Adam Pascal, with good stage presence), sings a song called “Will Power,” which is just as trite. More effective is “Hard to Be the Bard,” which takes us into his mind, reminding us that there’s a stressful side to being a successful, celebrity writer. Indeed, Shakespeare is depicted as a confident but struggling writer in the show. “Hard to be the Bard,” though, contains lyrics that are needlessly repetitive. “God I Hate Shakespeare” lets Nick express his dislike of the Bard and his frustration at Shakespeare’s success. It also sets the tone for the conflict between the Bottom brothers and Shakespeare.